Consumers are used to ordering goods online and then having packages waiting on the doorstep when they get home. It’s convenient, but sometimes it’s messy when packages are exposed to rain or snow, or when the neighbor dog plays hide-and-seek with the package, or if someone targets the house for a convenient theft while we’re at work. Sure, we can ask the neighbor to keep an eye out, but what if the neighbor isn’t home, or misses the action? While the costs of package theft has not been measured, one can assume the expense of stolen packages adds up for the shippers – and for the buyers. Ecommerce companies have been working on solutions. Jet.com (owned by Walmart) is using a smart lock made by Latch to provide one-time home entry by using a code. And now Amazon has gotten into the game with Amazon Key – a $250 service that includes a smart camera made by Amazon coupled with a smart door lock made by Yale or Kwikset. When the delivery arrives, the lock verifies that the driver is at the correct address and at the correct time. 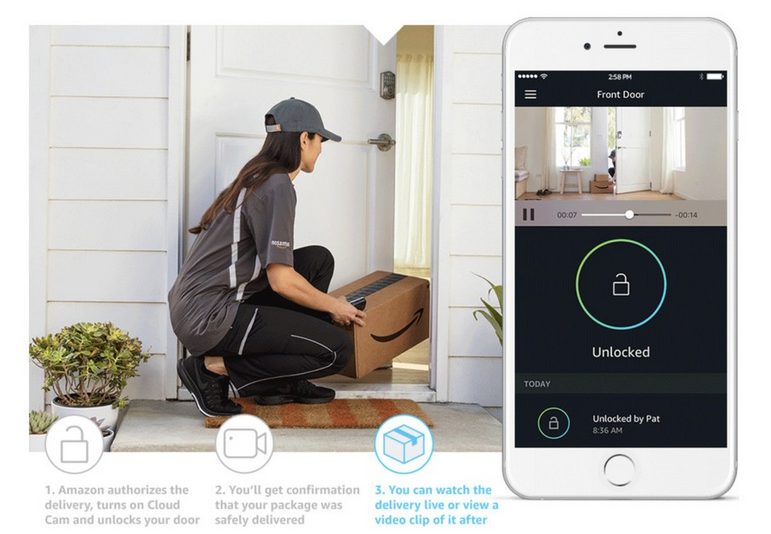 Amazon Key then starts recording video, unlocks the door, and records the entire delivery. It can even grant access to the home to other services such as Merry Maids (housecleaning) and Rover.com (dog walking). Amazon key is currently available in 37 cities and is open to Prime members (who already pay $99/year for fast shipping and other services). What will you have delivered? Discuss some of the problems that consumers have with delivery of packages. How does this service benefit consumers? Poll students: Would they use this service for deliveries? Why or why not? How should these services be marketed? Who is the ideal customer? Make no mistake – technology use is a global economic and communcation force. Consider that today more than two billion people use Facebook – that’s one-quarter of the world’s population! And, one in every five minutes online is estimated to be spent on Facebook. It’s potentially a juggernaut of massive proportions. With the extensive reach of Facebook and other technology companies such as Google and Apple, it is also a challenge to many countries’ governments control over their own citizen’s information sources and habits. Whether it is politics, music, business, or education, the reach of global technology companies represents a challenge for businesses and marketers. This is particularly true when technology companies in essence subsidize connectivity in developing nations. Economies of nations rest on profit-driven technology companies based in Silicon Valley. The Internet has a reputation of being a free-wheeling, anything-goes system that cannot be contained by nations. Or at least, not easily contained even in countries such as China and Vietnam. In the U.S., technology companies are facing new scrutiny by the government when it comes to politics, advertising, hacking, and controlling news. More than 50 counties have passed laws in the last five years to increase control over how their citizens use the Internet. And, in particular, digital privacy is a growing issue throughout European nations and the United States. Where is the Internet going? And, how should marketing use it? Discuss the role that technology companies play in global economies and policies. Discuss recent news about politics, hacking, news, bullying, privacy, and advertising buys. Divide students into groups. Have each group discuss what their experiences have been online. Task each team to come up with standards for how companies should use the Internet. Task each team to come up with five recommendations that could be implemented to improve online use and privacy.